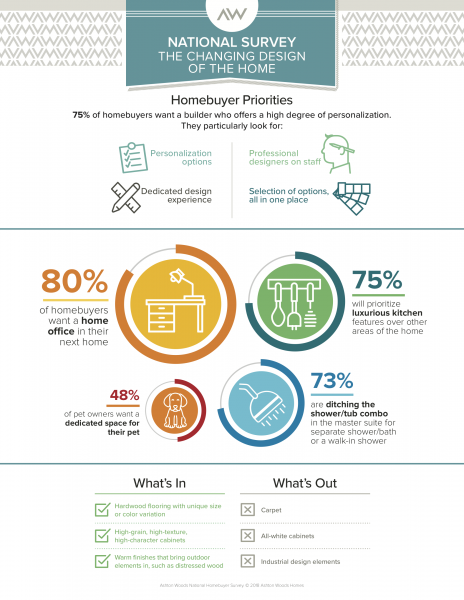 In its 2018 National Homebuyer Survey, production home builder Ashton Woods found that 75 percent of buyers are more likely to select a builder that offers personalized design options over one that does not. In addition, 67 percent of those surveyed reported that they were willing to pay more for a home builder who offers custom options, and 78 percent said it was important to be able to select all material and finish options in one convenient place. The ability to personalize was the second most important consideration (27 percent) for homebuyers when selecting a builder, behind customer satisfaction ratings (31 percent). The survey, which polled 1,405 people ages 27 to 70 who are looking to move within the next 10 years, also tracked a number of design trends and material preferences. It found that homeowners are moving away from all-white kitchen cabinetry (17 percent), instead opting for warmer natural wood kitchen cabinetry (30 percent). Forty-five percent of Baby Boomers preferred wood cabinetry, more than any other age group, and 27 percent of all participants said custom built-ins were the design element they would most likely consider implementing in their next home. For surfaces, the survey found that granite remained the strong countertop favorite, at 33 percent, over marble (24 percent) and quartz (12 percent). Other options such as laminate and concrete counters trailed behind at 4 percent each. Hardwood, at 37 percent, was a clear favorite over other flooring options, including parquet, luxury vinyl, laminate, carpet, tile, and other flooring materials. Carpet was simultaneously ranked as the second favorite option for some and the least favorite for others, showing the mixed views on the material. Photo courtesy of Ashton Woods. 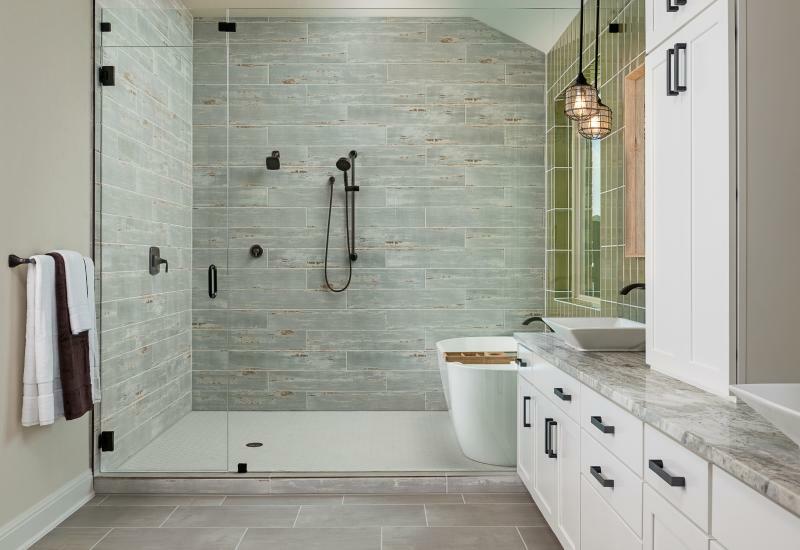 In the master bath, 73 percent of buyers reported that they would ditch the shower/tub combo, instead preferring a walk-in shower and no bathtub (37 percent) or a separate shower and bathtub (36 percent). Showing a lag behind recent trends, participants preferred brushed nickel (21 percent) and stainless steel (16 percent) over the recently popular gold (four percent), satin bronze (three percent), and satin brass (two percent). On finishes, Millennials broke away from the crowd, choosing stainless steel and oil rubbed bronze as their favorites. The survey also found that homebuyers want a laundry room (81 percent), home office (67 percent), and an entertainment room (59 percent) for their next home. Thirty-seven percent of respondents also desired a dedicated space for their pet. Indicative of the generational shift in interior style preferences, participants equally preferred transitional, traditional, contemporary, and farmhouse styles, at 14 percent each, shortly followed by rustic, at 12 percent. Baby Boomers preferred traditional design (17 percent), while Generation Xers favored transitional style (17 percent) and Millennials said contemporary was their favorite (16 percent). Ranch and modern were the most popular architectural styles, at 13 percent each. Read more results from Ashton Woods’ 2018 National Homebuyer Survey here.